Japanese drum manufacturer Yamaha is a key player in the electronic drum kit world, offering everything from beginner-friendly entry-level e-kits, to powerful, feature-packed rigs for professional gigging and recording drummers. Whatever your needs, here we’re rounding up the best Yamaha electronic drum kits for you. Yamaha was an early adopter in the electronic drum game, launching their futuristic PMC-1 kit in 1986. 10 years later the now-familiar DTX name was born. Yamaha’s five decades at the forefront of acoustic drum manufacturing has made a big impact on the quality of its e-kits. Yamaha electronic drum sets are notable for their reliable, adjustable hardware, and they also benefit from Yamaha’s range of quality acoustic kits, many of which have been sampled for DTX modules. With so much choice out there, exactly how do Yamaha electronic drum kits stack up against other big players like Roland? A key difference is that, rather than the mesh heads found on Roland’s intermediate to top-end kits, Yamaha offers its own material, which it calls Textured Cellular Silicone and is designed to recreate the feel and rebound of traditional mylar acoustic drum heads. It’s a unique material, but it really works. When it comes to the great debate of Roland Vs Yamaha electronic drum sets, which brand is best? 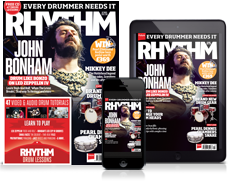 Both companies offer a range of electronic kits for every level of drummer from beginner to pro, from cheap to eye-wateringly pricey, and with their own take on key technologies and pad design. Our best advice when researching the right e-kit for you is to identify the features you really need, and try a selection before you by. If you’ve zeroed in on Yamaha as your brand of choice, here’s our rundown of the best electronic drum sets in the company’s range. If you’re just beginning your drumming journey, the ideal electronic drum kit is one that’s sturdy enough to take a beating, is adjustable and comfortable to play and offers a selection of kits that sound decent in your headphones; too many additional features can be distracting. Yamaha’s entry-level 402K is aimed squarely at beginners. For starters the compact kit takes up minimal space, while the silent bass drum pedal does wonders for neighbour relations. The rack is height adjustable too, so you won’t outgrow it for a while, and pads can be positioned where you need them. On the 402 module you’ll find 10 great-sounding kits covering every style from rock and jazz to dance and pop. Yamaha doesn’t scrimp on the education side of things either; the module comes loaded with 10 top training functions to help boost timing, speed and precision. What’s more, pair the module with the DTX402 Touch app (Android/iOS) to unlock even more lessons, challenges and kit customisation tools. When you’re ready to show your playing to the world, load up the Rec’ n’ Share app to, you've guessed it, record and share your playing. The DTX482K sits at the top of Yamaha’s entry-level 402 Series. This kit shares the same robust rack and app-connected module as the 402K listed above, providing drummers with plenty of kit customisation options, in addition to a wealth of excellent developmental tools. 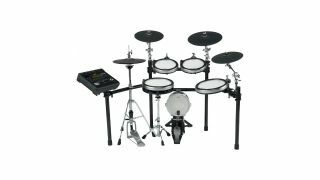 What sets this electronic drum set apart is the additional hardware you get for your money. The extra outlay bags you an additional crash cymbal, plus a sturdy bass drum tower and bass drum pedal for traditional drum set feel and response. The icing on the cake is the addition of a Yamaha XP80 triple-zone silicone snare which features a more responsive playing surface that brings drummers closer to the feel of an acoustic snare drum. Not only is this more forgiving on the wrists, but the more natural rebound should help you develop your single and double stroke technique much faster. Yamaha’s DTX502 drum module occupies the lower mid-range position in the company’s electronic drum kit offering. Giving scope for varying budgets and playing applications, Yamaha has produced five kits to accompany the new module offering various pad options. The DTX502's module gives the user a total of 691 drum and percussion samples and 128 keyboard voices. There is also plenty of space for user kits - 50 of them in fact. While many of the drum samples are taken from Yamaha's classic acoustic drums, this module is the first in the DTX range to incorporate additional sounds created by third-party VST developers. Samples are crisp and clean without being clouded or 'improved' with compression or masses of reverb - just a really great drum sound. Features on the cymbals such as muting, swells and choking are authentic and makes the whole set more enjoyable to play. You are not confined to these onboard voices thanks to the USB port, which gives the user access to the wealth of drum sample libraries readily available. Aside from three 8” rubber tom pads, bass drum tower and three triple-zone, chokeable cymbal pads, the kit also comes complete with a KP65 kick pad and triple-zone XP80 silicone snare. While the rubber pads have the kind of feel and response that's fairly typical of many budget-type kits, the impressive snare, cymbals and kick pad help elevate the kit far beyond this level. While the lower-end kits in the 502 series offer a great deal for your wallet, it is worth shelling out the extra for the enhanced response and feel of a full complement of Textured Cellular Silicone tom and snare pads, plus the stand-mounted hi-hat that you get with the DTX562K. With this kit you get even even closer to the feel and action of an acoustic drum set, with all the benefits of quieter pads, headphone amplification and a range of great sounds at your fingertips. As with the DTX522K, the 562K is bundled with the powerful 502 module. The lightweight and robust Yamaha DMR502 module/rack features a resin ball-type snare mount for optimum pad positioning, while the pad line-up includes the excellent KP65 kick pad, the triple-zoned XP80 silicone snare, plus three 7” silicone tom pads. Cymbal pads include the two-section RHH135 hi-hat which fits to a traditional hi-hat stand and works like a regular pair of hats. It feels natural natural, responds superbly and makes it far easier to re-produce hi-hat chops compared with just a hi-hat controller. Taking the leap up to Yamaha’s DTX700 series represents some serious upgrades in terms of both hardware and module features and performance. There are two kits in this range, both offering plenty for the intermediate to pro drummer. The cheaper kit comprises an XP80 silicone three-zone snare, three XP70 silicone toms, two three-zone crash cymbals, a ride cymbal and a set of stand mountable RHH135 two-zone hi-hats. A key upgrade from the DTX562K is the formidable KP100 bass drum pad, complete with a mesh head that’s big enough to accommodate a double pedal. There’s also a new rack system in tow. The RS502 is designed to be compact, whilst giving drummers plenty of adjustment options to get their pads sitting right where they want them. If you’re looking for a huge breadth of amazing sounds, the DTX700 module has you covered. While 60 kits might sound like not many at this pricepoint, the module houses 1,268 drum and percussion sounds that include samples of legendary Yamaha acoustic kits such as the Oak Custom. These sounds can be used to create custom kits, complete with tweakable effects, or you can add your own external sounds via USB, record MIDI data into your DAW or play a VST sound source. If the spec of the DTX720K sounds up your street but you have a little more cash to splash, the DTX760K offers even more bang for your buck. That extra outlay covers an additional crash cymbal, the superb XP120SD silicone snare which is not only stand-mountable and offers a larger 12” surface to strike, but a control knob on the rim can be used to tune the drum up or down, or turn snares on/off in real-time. Additionally, the package comes complete with larger 10” and 12” tom pads and a slick RS700 rack system. Out of the box you have a great, natural feeling palette on which to paint your beats, and that’s before you get under the hood of the DTX700 module. It’s loaded with sounds that can be customised to your liking and makes this kit the ideal tool for practice, recording and even gigging. If money is no object and you need a kit that elicits practically the same response and feel as an acoustic drum kit, while placing amazing customisation and sampling technology at your disposal, Yamaha’s flagship DTX920K electronic drum kit should be somewhere near the top of your electronic drum set shopping list. No expense is spared as far as hardware is concerned on this kit: the set-up comprises four premium X-series three-zone silicone pads for toms and snare, the monstrous KP 100 bass drum pad, plus four dual-zone cymbals, including the excellent RHH135 stand-mounted hi-hat. One of the key features of the sophisticated DTX900MM module is the ability to record samples natively and add your own via USB. What’s more, your can take these samples and, using the Stack function, layer multiple voices on a single pad. Want hand claps over your snare, or a vocal sample to trigger every time you hit the floor tom? You got it. Not only is the DTX920K a fantastic practice and home recording tool, but these features make it a powerful live performance kit too.